In our house, we always recycle. Every little bit we can scrounge up goes into our recycling bin. The only problem about recycling everything is that it creates such a mess. We always tried to put bottles and stuff into plastic bags, and then tie them up, and it would be fairly easy. But after we received our new recycling bins from the county, we also found out that they actually don't accept plastic bags. So, we had to stop. So for the past year or so we've been using cat food bags. It did the job, but it looks hideous sitting in our kitchen on the floor, and plus, with all the bottles, it always ends up getting sticky, and disgusting. And let's be honest, the cat bags are not that sturdy, and eventually everything starts leaking, and we end up with a big mess. 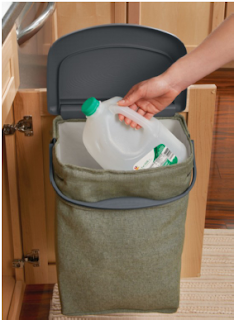 So I was so relieved to try out the Hidden Recycler from Rubbermaid! This awesome recycler is great, because it can actually hook onto your cabinets (on the inside) and it is completely our of sight. I was always so embarrassed having out cat bag filled with empty bottles and such sitting there, and it's just such a relief to have something that we can keep our stuff in, without looking tacky. My favorite aspect of the Hidden Recycler is actually that it is so sturdy! The bag has a leak-proof liner, so you never ever have to worry about leaks or messes inside of your cabinet, where it's being stored. And if the inside of your recycler gets nasty and messy, no worries! The liner is actually machine washable. So if it gets sticky or starts to smell, plop it in the washer, and it's like brand new! Another thing I also love, is that the recycler can actually store quite a bit; up to 36 12oz cans and a jug of milk! That's quite a lot! Overall, I think this is an awesome product, and I am so happy I had the chance to review it! 1 of you will receive a hidden recycler of your own, from Rubbermaid! Entering is super easy (as always) with the Rafflecopter form, directly below. This giveaway is open to US and Canada. Disclosure: Review product was provided to me free of charge. All opinions expressed are my own, and were not influenced in any way. Facebook is not associated with this giveaway. This giveaway will end on April 15th, 2012 at 11:59 pm. Winner will be drawn via Random.org, and winner has 48 hours to respond to my email, before a new winner will have to be chosen. I love the Fast Track Adjustable Closet kits. The ActionPacket is pretty cool for organizing. I would love the try their LunchBlox™ Sandwich Kit!! I adore the Design Bottle in Cherry Blossom! I'd like to try the Bento Boxes, I like that they have dividers in them. Hmmm, let's see, the Stackable Recyclers, A Slide Lid Shed, and at least four of the 2-Shelf Closet Helpers - for starters...! I like their Bento Boxes! I would like to try the large drawer for the pantry or the shelf track and bin. My pantry definitely needs help! I want the 6 peice Bento set. The LunchBlox™ Sandwich Kit would be great for my teen for high school! I would like to try one of their Customizable Closet Kits. I'd love to have their Bento Boxes in Paprika! I like their deluxe closet configuration kit. Thanks for the chance. I would like to try the LunchBlox Sandwich Kit! I would like to try the large drawer that you can add to your pantry and use for items that don't fit quite right. LunchBlox™ Lunch Bags sounds like something we could use. I would love the bentoboxes.. I want their Bento boxes! I love the bento boxes or stacking bins! I love the bento boxes! These are great! I would also like to have the stackable recycle bins. Oh that is nice. Our town doesn't do recycling so big plastic bags that stack up are for us until we can get to the store. I would love the 75 Qt DuraChill™ Wheeled 6-Day Cooler. I love the Front Seat Organizer for the car! I would like to try their new Spray Scrubber. Looks like a great cleaning tool! 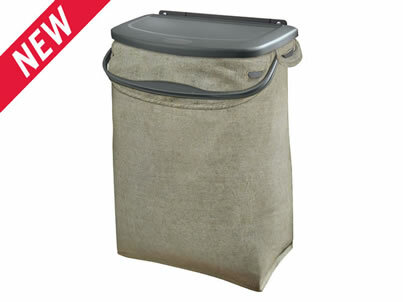 I also love the Specialty Storage Flex Totes at Rubbermaid. Thanks for the giveaway. I would love to try the Stackable Recyclers. Thanks! I would like to try the bento containers in paprika. I'd also like to try their 2 in 1 recycler. I would like to try the Flexible Sweeper. I would love the Reveal Spray Mop! i'd love to try the lunch blox sandwich kit! I would like to try the Slide-Lid Storage Shed 3752.